We need food to maintain good health and survive. No one is disputing that fact. But have in mind that you are responsible for whatever you consume and that there are consequences when you promote unhealthy lifestyles or habits. Many of these life-threatening issues wait till when one starts aging before they strike. Unhealthy lifestyle is not the only factor that can have a massive impact on one’s health. Food also does. There are dangers when we continually eat foods that contain excess sodium (table salt). Have that in mind. This post concerns everyone (young and old people). Reports on millions of people that die every year from high blood pressure issues should serve as a wake-up call for everyone to start doing the right thing. So, how do we ignorantly make ourselves unhealthy? And how can we restore our health? Read on to learn more. Many of us are guilty of this; we only have an interest in how to make our meals delicious and tasty when we cook. Health doesn’t matter as long as the food is tasty. That is how we live our lives. However, we are not saying it’s wrong to prepare delicious meals. But, it’s advisable always to consider your health when deciding what to cook and what goes into your system. That’s because good health is what’s most important. So, even if the food is super delicious, will it contribute to good health? What does sodium have to do with high blood pressure? The salt you add to your meals can give rise to high blood pressure. It may not happen now, but have in mind that you are putting yourself at higher risk in the future when you consume excess salt regularly. So, while adding more salt to improve the taste of your meals, think about your health first. One organ that suffers the most when we consume excess salt is the kidney. And if you are familiar with how these two bean-shaped organs operate, you will understand that their duties are as relevant as other internal organs in the body. The point here is excess salt might lead to salt-induced kidney damage. It can also make the kidney unstable and unable to discharge excess toxins from the body the way it used to do. Here is another thing that happens when we consume excess salt. The kidney will find it harder to keep up with the excess amount of sodium already in the bloodstream. And as sodium begins to accumulate, the body will have no other option but to hold on to more water so it can dilute the excess sodium. As a result, the volume of blood and that of fluid surrounding the cells will increase. The increase in blood volume will put more pressure on the blood vessels that they can handle. However, the increased pressure and work the heart and blood vessels are made to undergo is not something one should take lightly. These actions can stiffen the blood vessels and cause life-threatening conditions such as high blood pressure, stroke and even heart attack or heart failure. Several studies have also claimed that excess salt can damage the kidneys, aorta, and heart without even raising blood pressure. People above the age of 50. Those with slightly elevated or high BP. African Americans (they are at higher risk of developing high BP). But, whether you fall into this category or not, you have to watch your salt intake. Excess salt consumption is not good for health. It can affect anyone adversely. Now that you know what excess sodium chloride (table salt) consumption can cause, how do you plan to curtail it? Here is a list of options you can adopt. Get the salt shaker off the dining table. Seeing it on the table will surely tempt you to add more salt to your meal. Avoid or eat less processed foods because they contribute to about 75 percent of our salt intake. If you must consume processed foods, check the labels first to ascertain the quantity of added salt. Learn to cook with less salt. It is also best to add salt gradually than adding a large quantity at once. You may end up adding too much if you don’t add progressively and taste to know if there is enough salt. Do not exceed the recommended daily salt consumption of 2300mg for grown-ups. You have already read and understood the health havoc sodium could wreck. But do you know that potassium can have an opposite effect as sodium on an individual’s health? That’s why people are usually advised to gobble up more potassium-rich foods. 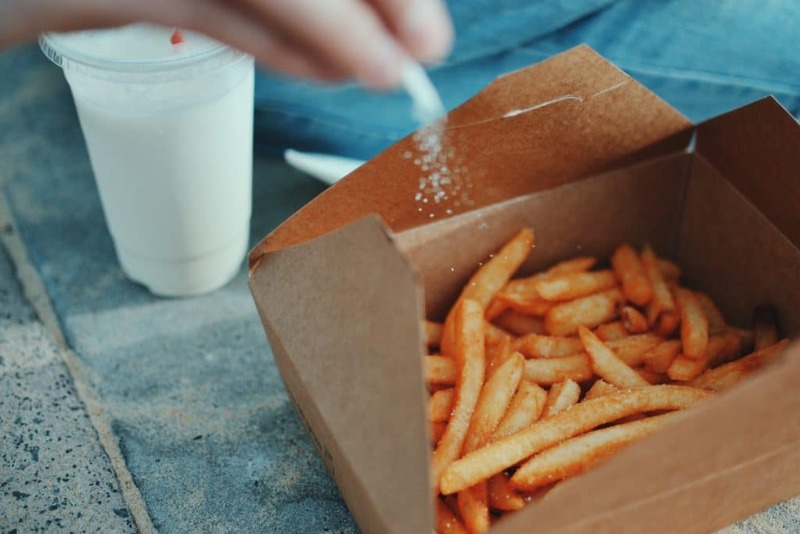 If excess salt consumption can cause heart disease, potassium, when taken in excess amount, can help you to excrete more sodium (table salt), relax blood vessels and decrease blood pressure drastically. So, the bottom line is that your body needs to have more potassium to balance the excess sodium that we ignorantly consume from processed foods. It’s a critical decision everyone needs to take whether you are living in an industrialized nation or not. Taking excess sodium and low potassium increases one’s risk of dying from a heart attack or other causes. Dietary changes such as eating more fruits, vegetables which contain a high amount of potassium and low sodium naturally, can lower one’s risk of cardiovascular diseases. In other words, avoid or reduce consumption of cheese, bread and processed meat which contains high sodium and low potassium. High blood pressure is not something anyone should treat with kid gloves. It can end one’s life within a blink of an eye. In addition to the above-shared tips, you also need to check your blood pressure regularly because hypertension does not give warnings sign before striking. You can also consult a blood pressure chart if you have challenges understanding the reading. And always consume the right food that will enhance your health. Otega Clement Okperigho is a prolific writer. He loves reading, researching and providing information on health-related issues so that people can acquire more knowledge and lead a healthy life. You can read more of his write-ups on health issues here. « How Digital Health Technology Helps Fight Cardiovascular Diseases?